In mild climates rhododendrons and azaleas can be planted almost any time of the year with reasonable success. In colder areas, early spring planting is recommended, with early fall planting being a second choice. In hot areas, fall planting is recommended, as this allows the plant's root system to get well established during the colder fall and winter months. Rhododendrons and azaleas do well with direct light for at least part of the day. Excessive shade normally results in very limited flowering. In hot areas, northern exposures are preferable to southern exposures. Exposure to constant wind is not desirable, especially the salty winds of marine environs. Generally large-leaf rhododendrons are less tolerant of sun and wind than small-leaf rhododendrons or evergreen and deciduous azaleas. Proper soil conditions are very important. (See Soil Conditions for more information.) Rhododendrons are acid loving plants. As such they perform best when the soil is acidic (with a pH between 4.5 and 6.0). They need well-draining soil with an abundance of organic matter. Rhododendron and azalea roots also need oxygen for healthy growth. Many materials can be used to amend the soil. Compost or decomposed pine bark are very effective. Heavy clay soils collect and retain water so it is recommended to plant rhododendrons and azaleas above the base clay soil in a mound of desirable soil. (See Figure below.) If you dig a hole in heavy soil and fill it back with a light soil mixture, you may be creating a bucket which will hold significant water. 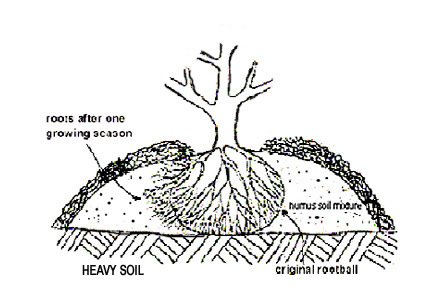 The top of the root ball should never be below the level of the surrounding soil. The top of the root ball should be planted several inches above the surrounding soil. Planting rhododendrons and azaleas too deep can eventually lead to plant death. Planting near concrete foundations or other concrete materials is to be avoided as the concrete creates alkaline conditions (a pH of 6 or above) that are harmful for healthy rhododendron and azalea growth. People often use aluminum sulfate to lower the pH of soil, i.e. make it more acidic, for growing hydrangeas. Using aluminum sulfate to acidify rhododendron soil is not recommended as aluminum is toxic to rhododendron and azalea roots. To lower soil pH use wettable sulfur or ferrous sulfate. In hot climates, root rot organisms flourish in wet soils and can kill rhododendrons and azaleas. Under these conditions, raised planting beds that incorporate 50% or more fine pine bark can be helpful in suppressing Phytophthora root rot. Extreme cases may require the use of fungicides such as Subdue or Aliette. Always read and follow label instructions when using chemicals. Soil from plants that have succumbed to Phytophthora should not be reused to plant more rhododendrons. Plants should be thoroughly watered prior to planting. The roots should be loosened. Root bound plants that have been in containers for a lengthy time should be thoroughly loosened, and some of the outer roots cut. With a knife make vertical cuts 2" or more deep, equally spaced around the sides of the root ball. Use your hands to gently loosen the roots where cuts were made and pull the roots outward. This will stimulate new root growth and allows water and nutrients to penetrate into the root mass. Field grown plants are dug up with a ball of soil around their roots, and the ball is then wrapped in burlap or a synthetic material and tied with twine or wire. Such balled-and-burlapped plants can be damaged if handled roughly. Always support the bottom of the root ball when moving the plant; avoid dropping the plant which might shatter the root ball. The burlap may be left on the root ball unless it is plastic or otherwise non-biodegradable. Open up the biodegradable burlap and lay it well back from the trunk, remove any cord or wire. Field grown plants typically are grown in heavy soil that holds the ball together when dug. Loosen the rootball and cut some of the roots to stimulate the growth of new roots. 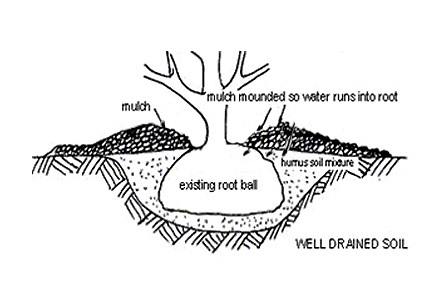 The texture of the soil surrounding the root ball should match that of the rootball. Rhododendrons and azaleas rely upon their shallow root structure for their water and nutrients. It is very beneficial to mulch around the plant at least out to the drip line. Do not pile the mulch right up to the trucks, leave 5" - 6" free of mulch. Mulching helps accomplish several important functions. It helps in keeping the soil moist and cool. As it decomposes it provides nourishment for the plant. Competing plants and weeds have a more difficult time getting established so they are not taking the moisture and nutrients. Many materials are useful as mulch, such as fir bark, pine needles, wood chips, composted materials, etc. Ideally, the mulch should have loose texture to allow water and air to reach the root zone. Chips, bark, compost materials, etc. should be allowed to age at least for a season so that they do not use up the available nitrogen to decompose, thus leaving less for the rhododendrons. They are not sufficiently decomposed if they heat up.